Auchan Direct offers grocery home delivery to customers in the Greater Warsaw area. Auchan's grocery home delivery subsidiary Auchan Direct is introducing a click & collect option, Handel Extra reports. The pilot is reportedly taking place in the recently inaugurated minimarket located in Warsaw. While there is a charge of up to PLN25 (EUR5.57) for same-day home delivery, click and collect from the store is free of charge. We believe Auchan Direct trialing click & collect is a logical next step on many levels. Firstly, Auchan Poland needs to stay in the race with its competitors. For instance, Carrefour has been introducing grocery click & collect in the Polish capital city over the past few months, not to mention fast growing online supermarket Frisco. Secondly, as much as home delivery has a strong added value for a minority of affluent but time-stretched customers at this early stage of e-commerce development, it will become increasingly difficult to surf on the growing wave of grocery e-commerce as competition multiplies. We’d then expect cheaper fulfilment alternatives to emerge, reducing the burden of the costly last mile. Click & collect for Auchan Direct – as for the competition – is often free of charge, an advantage that cannot be ignored in a price sensitive market such as Poland. Despite nearly six years of operation, Auchan Direct is still limited to Warsaw and its suburbs; it has refined its model and adapted to local preferences... but still does not seem to leave the starting blocks. 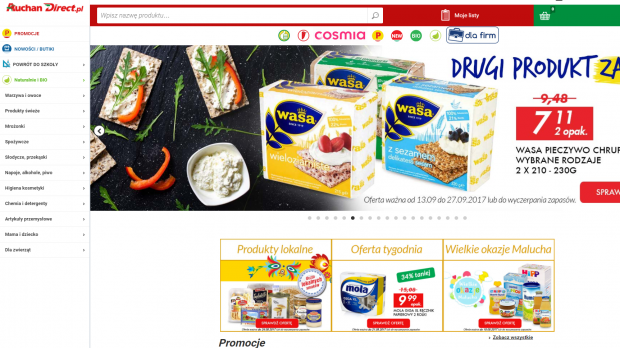 For us, this naturally raises concerns about profitability, while at the same time, confirms that grocery e-commerce in Poland is still in its infancy. Coincidentally, the introduction of the My Auchan minimarket has provided the opportunity for the pilot, ensuring the retailer remains ready for the next channel development it faces. To understand the likely development scenario for Poland's future, one need only look at its older brother in France. There, Auchan Direct is also experimenting with click and collect at Auchan's minimarkets, as well as 24/7 collection lockers. Faced with multiple operators huddling around major French cities, the popularity of click & collect and Amazon’s foray into groceries; the banner had no other choice but to differentiate by significantly increasing its assortment to nearly 17,000 SKUs and offering delivery within 24 hours. In Paris, the lead-time is just six hours thanks to a shiny new fully-automated warehouse with four different temperature zones, where nearly only fresh produce has to be picked manually. Even so, despite its best efforts to keep costs, execution and service quality under control, in France, as in Poland, profitability continues to be elusive.